Citizen watches have announced the latest from the Citizen Satellite Wave GPS range with a two new additions set to turn heads. This is the model with the fastest timekeeping signal reception speed in the world, from GPS navigation satellites! Authorised retailer for Citizen Watches. Free delivery, 30 day free returns and five-star rated service. Buy now with up to 12 months 0% finance. Citizen are renowned for reliability at a fraction of the cost of the luxury brands. Citizen pride themselves as being ahead of their time, their brand stands for innovation and high precision that make life better for ordinary people. The company was originally founded in 1918 as Shokosha Watch Research Institute, the name Citizen came from the first pocket-watch they produced in 1924. The pocket watch was named Citizen because they hoped they could make the luxury pocket-watch affordable to ordinary citizens throughout the world. The Citizen Watch Company Ltd was established in 1930 and they have been the world's largest watch manufacturer ever since 1986. In 2014 Eco-Drive technology helped Citizen become the first watch manufacturer to win the gold prize at the Eco Mark Awards. The revolutionary Citizen Eco-Drive technology harnesses the power of light, from both natural and artificial sources, then converts it into energy to power the watch. The cutting edge technology has created a range of watches which will never require a battery! Enough energy is stored inside the watch to power it for six months in darkness once fully charged and longer with exposure to artificial lighting. Eco-Drive has had a positive impact on the environment since the first Eco-Drive watches were released in 1995 by keeping 40 million watches out of landfills. Citizen are always developing and perfecting new technologies. After perfecting Eco-Drive they moved onto atomic timekeeping, which works through regularly receiving an accurate radio signal to provide extreme precision. Some of the watches that harness the power of atomic timekeeping are the Citizen Radio Controlled Titanium Skyhawk, Citizen Perpetual Calendar Chronograph and Citizen Radio Controlled World Timer. 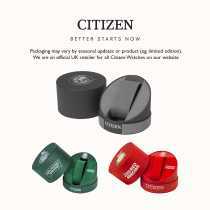 Now, Citizen have turned their efforts towards GPS watches with the new Citizen Satellite Wave-Air range. This allows for accurate timekeeping wherever you can see the sky. Citizen watches are reliable and will stand the test of time. For your piece of mind all Citizen watches come with a 5 year guarantee which is extended for a further year when you register with Citizen UK.